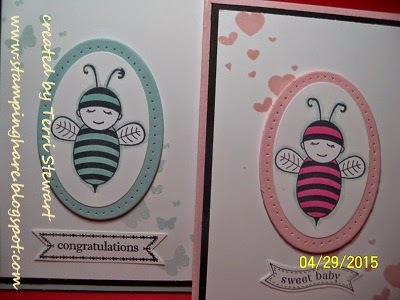 Wedding and Baby card class, tomorrow Thursday April 30th, 7 to 9pm; tuition is $10 (or free with minimum order). A few spots left, RSVP now! Retired List was released last week; accessories are available while supplies last and several items are sold out. Retiring stamps will be guaranteed through May 26, order your favorites now before it's too late! Free crafting night for My Paper Pumpkin subscribers who select me as their demonstrator; bring your kit and get your pumpkin on! Pumpkin kit night is held the last Monday of the month, 7-9pm; upcoming Pumpkin nights are June 11 (May make-up) and 29. Click here to subscribe and join the fun. But wait there's more! Kit subscribers can purchase kit refills and additional kits (while supplies last). During the Free Shipping promotion subscribers receive free shipping on kits and refills purchased from my online store (click here). 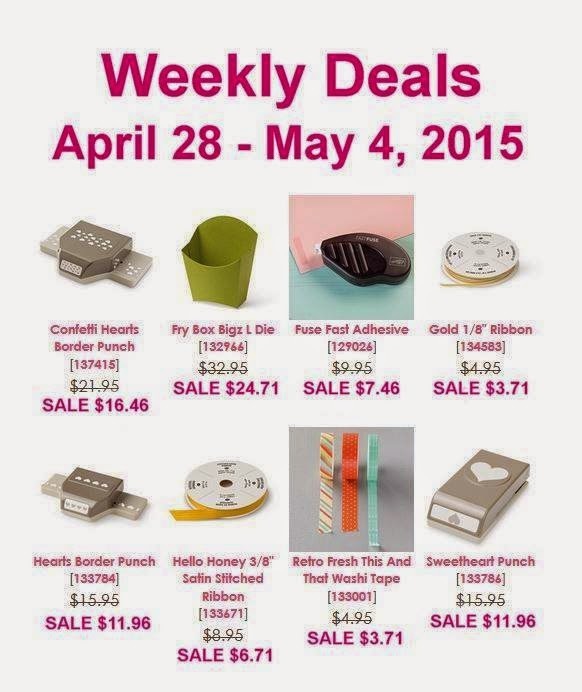 Save 25-to 40% on these items through today Monday May 4th. New items revealed every Tuesday. 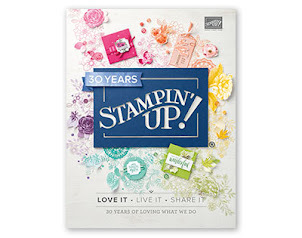 Stampin Up has announced a Free Shipping promotion! Today, April 6th through Friday April 10th enjoy free shipping on all orders, no minimums! Order for yourself or your out-of-town family and friends, shipping is free! Free Shipping on April 6th (today) through Friday April 10th--no minimums! Check out the newest photopolymer stamp set -- Just Kidding. Order yours today! Due to manufacturing quality issues Stampin Up will no longer sell Blendabilities markers. The Occasions Catalog has several fabulous kits as well as stamps and accessories for every occasion through June -- Easter, weddings, baby, graduation, etc---you get the picture! Need a catalog? Contact me! Perpetual Calendar, Saturday April 25th, 1-3pm. Stamp a beautiful perpetual calendar for yourself or give it as a gift for that special someone (it comes with a fabulous gift box! ); tuition is $25 includes the calendar kit. RSVP and tuition due no later than April 15th. National Scrapbooking Day, Project Life class, Saturday May 2nd, 1 to 3pm; tuition is $15 (or free with minimum order) RSVP and tuition due no later than April 18th. Free crafting night for My Paper Pumpkin subscribers who select me as their demonstrator; bring your kit and get your pumpkin on! Pumpkin kit night is held the last Monday of the month, 7-9pm; upcoming Pumpkin nights are April 27, June 11 (May make-up) and 29. Click here to subscribe and join the fun. But wait there's more! Kit subscribers can purchase kit refills and additional kits (while supplies last). During the Free Shipping promotion subscribers receive free shipping on kits and refills purchased from my online store (click here).